"When peace finally came, it was the sort of peace that haunts prisons and cemeteries, a shroud of silence and shame that rots the soul"
“Wars have no memory, and nobody has the courage to understand them until there are no voices left to tell what really happened, until the moment comes when we no longer recognize them and they return, with another face and another name, to devour everything they left behind"
Carlos Ruiz Zafon creates War and its Aftermath (which for ease I will call Aftermath with a capital “A”. Even though Zafon refers to that time after War as Peace, I don’t think it felt especially peaceful, as the lingering effects of War were still causing distress with attempts made to repress memory) as nearly personified forces. I’d say “elemental” forces but I’m not sure that will carry the same meaning universally as an elemental being leads my thoughts to a humanoid shaped being constructed of X element. Or in this case, a dispersed body with a will / purpose but lacking the complexities of human character. I’m drawing these thin lines across ground that maybe nobody cares about to begin with. I do though. It affects the tone and feel of the story to think of an actual, living, malignant force suffocating Spain. And then it becomes “other”. War isn’t described as action taken by people, not as people behaving badly / cruelly. The people involved in the war have left their human bodies (they no longer act or understand as humans do) and are thus untouched by human emotion (their own) and cannot be understood by others. In the beginning of the story, Barcelona is surrounded by War but the residents hold their breath hoping that it skips them by. That’s the first effect of War, to create a terror that denies confrontation. Everybody in the city not talking about, no behaving as though it’s near, but characters retelling the stories of their lives during this time make it clear the thought of it has hallowed out a portion of everyone’s mind. They are not going about their lives “as normal” but purposefully avoiding any contact. Then War does come into Barcelona. Any stories told of this time are bereft of the precise details that are usual in the stories any character tells of their past. Everything is vivid, from dates to emotions, but not anything of War. It’s that Terror that War brings that has pushed them out of living in the present moment that these characters typically do, and forced them into a numbed state. Events are still recorded on some level: the torture, killings, and shifting alliances of Francisco Javier Fumero aren’t missed or ignored, just not engaged with. War is being characterized by the reaction to it. War is a monster too terrible by reputation to even look at. In this way, as one unified force divorced from human input, War’s form (how it is fought) cannot be altered in part of whole, nor can it be associated with any noble ideas. I contrast this with the current (2011, United States) conception of war as a tool, used in limited or full scale effect, and expressing some idea (liberation / freedom). 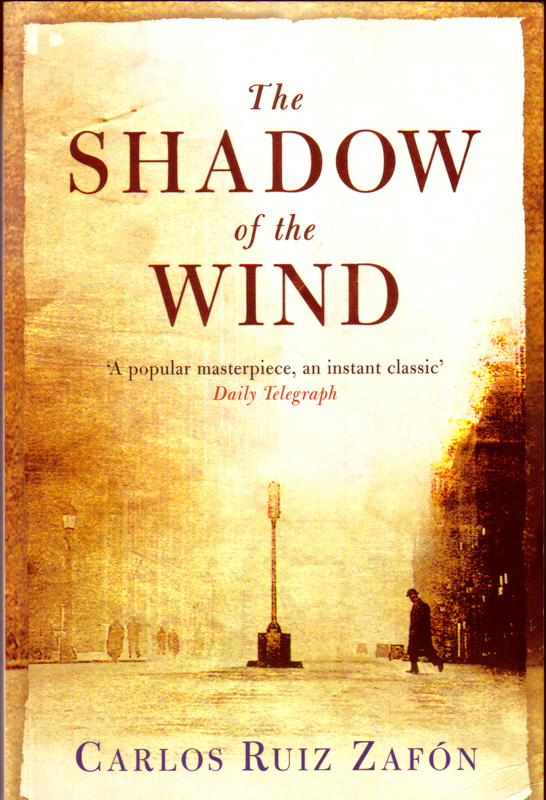 In The Shadow of The Wind universe, War possess humanity to destroy it. There can be no debate then: War is evil. The Aftermath personifies the malaise of Barcelona. It’s the intense regret of the citizenry being unable to confront War and thus being abused by it. It’s the feeling of losing one’s dignity, and to some extent their sense of self. Meaning that, again, all are bullied into a quiet regarding, exactly, what happened to them and their city. Nobody will confront the war, even after it’s past, because to do so will necessitate reliving their shame of who there were during it. By attempting to save face, the war generation deprives the next of any guard against war coming back. Daniel’s investigation seems to pull the lingering life out of all the war’s survivors. They give away all their secrets and hopes at being remembered well posthumously, gaining small relief from whatever infected them. Which isn’t to say they were “saved”, the evil cloud scattered, as each was disfigured (metaphorically, though Julian Carax was physically) by the events of the war. There isn’t a reset to happy times. Actions matter because their result must be lived with. The relief comes from no longer worrying or caring about the eventual consequences. Like a body’s death sigh; the fight is over but the outcome is still death. Making Daniel an innocent little soul collector. Curiosity started him off but fear from the numerous threats he soon gathered is what pushed him to fully coax out the truth. His chief interest was preserving himself. That makes sense too, to finish the characterization of humanity as selfish, giving reason for the weakness which makes it easily penetrated by War. 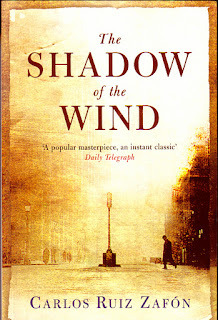 What’s so astounding and beautiful about Carlos Ruiz Zafon’s prose is that it creates two worlds at once. One is the story, the combined sequence of actions with Daniel at the center. The words. The other is a loose, outlined but undefined, painting. The image of War circling Barcelona. War coming back with another face. To me if feels as though he painted a giant, Sistine Chapel-like, story. It’s one image but as your eyes take it all in the story presents itself. He does this at least once a chapter… It’s how one imagines a story about War and Aftermath, with all its secrets, without the aid of words to describe them. They have to be given form. The two worlds reflect slightly different versions of the other back, inspiring but not giving a more nuanced understanding of them both. And just to heap the praise on, the worlds are equally interesting and beautiful. Beautiful not a description of quality but the qualification of form. The concept of. I’ll call this a book just so anybody can identify the physical space it occupies. About as accurate and useful as “over there”. This book is a work of art.